Find out the list of all current courses. 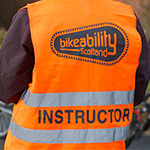 A one-day course that enables you to deliver Bikeability Scotland levels 1 and 2. During the CTA course, candidates learn how to plan, prepare, deliver and conclude training sessions, including dynamic risk assessments of playground and on-road training locations. The course does not qualify CTAs to carry out static risk assessments of cycling routes and training locations, and therefore they must be supported by someone qualified to do so, ideally a Cycle Trainer employed by the host organisation or local authority. CTAs can expect to deliver sessions independently (or with other CTAs where class ratios demand), sometimes with support during the first few sessions, but moving to remote supervision once a CTA feels confident in the role. Although many of our new instructors are already experienced cyclists and trainers, we do still recommend that they attend the CTA training as it serves as an orientation to the contents of the course and handbooks, it goes through the logistical processes involved in setting up training sessions, and it also ensures that all instructors are up-to-date with the latest National Standards for cycle training. Prerequisites: You should ideally be a competent cyclist and must be a minimum of 16 years old, or 18 where working independently. A four-day course that allows you to deliver all 3 levels of Bikeability Scotland, as well as any course that teaches the National Standard for cycle training. Cycle Trainers are able to conduct static risk assessments on cycling routes and training venues. Prerequisites: You should be fully competent on a bicycle and have experience of riding on busy roads. If you'd like to attend the Cycle Trainer course in order to train adults, the cost is £300 per person or £1,500 for a group of 5-8 participants. You can book an individual place on a course by registering with one the classes listed here, or set up a course for a group by emailing training@cyclingscotland.org. Prerequisites: You must be qualified to Cycle Trainer level and have experience delivering Bikeability Scotland training. If you are planning to deliver Bikeability Scotland to children (or train up new Cycle Training Assistants) on a voluntary basis, your local authority should be able to offer you a place on a free training course. Please contact your local authority co-ordinator to arrange this. A one-day course that allows you to take groups on short bike rides (1-2 hours) along routes that have previously been risk assessed. Tutors are our most experienced instructors who are able to deliver all our training courses. All Tutors receive tutor training and then complete a period of supported course delivery before receiving their accreditation. Cycling Scotland recruits Tutors periodically, so please contact our office if you'd like to register your interest in becoming a Tutor: info@cyclingscotland.org or 0141 229 5350. What is a Cycle Friendly School Award?